It seems it’s been a while since I’ve last written. I’d say shame on me, but it’s not all that bad. I haven’t forgotten about you, though I’m perhaps getting a little too comfortable nesting in our warm home awaiting the arrival of our newest little one. For those of you keeping track at home, I’m roughly 86,000 40- some-odd weeks pregnant and trying not to be antsy. She’ll come along when she’s ready, and in the meantime, we have an extra ultrasound to look forward to this coming Monday. Fingers crossed for 4-D so we can see what the little Sattin-ita looks like. Then again, if she comes before Monday, I guess we’ll know what she looks like then. Either way, we win. Teaching Dash how to vacuum. Turns out he’s a natural with lots of enthusiasm for the task. It’s tough to say no when your 22-month old asks if he can vacuum the rug. Especially in robot pajamas. And yes, that is our Christmas tree in the background. More on that later. 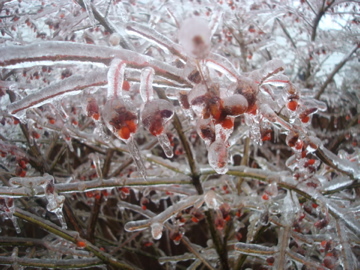 Getting slammed with an ice storm! It’s funny when you don’t watch the news for a few days. You tend to get surprised by quite slippery conditions when you’re out running errands. Then you wake up to the sight of blueish green explosions in your neighborhood; transformers exploding maybe? It only resulted in a brief period of time without power (while we were asleep, even), though others are still awaiting the return of theirs. 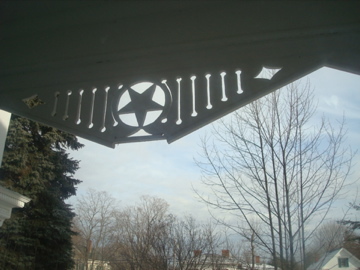 Going to look at a new house, which I promptly fell in love with. Just look at this detail! 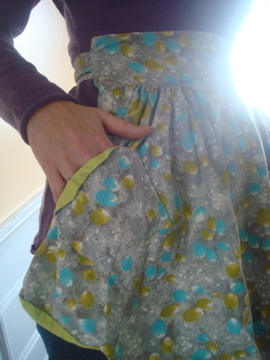 Adding some new items to the shop, including this apron, some Pyrex, a Thermos, etc. Good stuff if you’re into it. And a wee bit of decorating for Christmas, emphasis on the wee. I have boxes that haven’t been opened and won’t be. I (being the one in our family who’s celebrated Christmas all her life) haven’t the energy to fully decorate this year, though I do still want to. Neil has embraced Christmas (note: we do both Hanukkah and Christmas around these parts) but not quite to the extent that he wants to decorate the house. He likes to see it in the house, but he hasn’t realized he can and should be a part of it yet. We’re working on that. So consequently, it’s Christmas-lite this year. Stockings are hung by the staircase with care. A very pathetic and small potted pine tree holds up some strings of lights and roughly six ornaments- all its branches can support. I won’t pretend this tree is fulfilling my Christmas tree desires but it is what it is. Christmas is about family in my eyes, and family is just what we’ll have gathered around this, our version of a Charlie Brown tree, come Christmas morning. Well, enough about me. What have you all been up to? How are you decorating for the holidays? Going all out or scaling back? I’ll be back tomorrow (baby permitting) with a little something about holiday gift giving during this season, which has turned out to be difficult for so many. 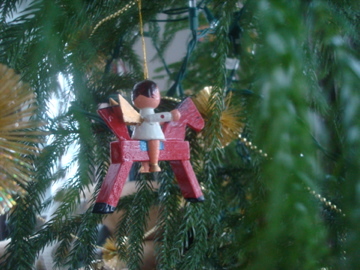 This entry was posted on Wednesday, December 17th, 2008 at 3:23 pm	and is filed under Dork Mom. You can follow any responses to this entry through the RSS 2.0 feed. You can leave a response, or trackback from your own site. I love your little tree! 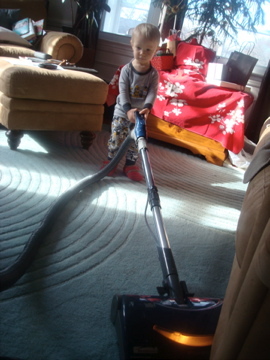 And I love seeing your little man with the vacuum. Mine has figured out the switch and so every time I try to vacuum he runs up to me & turns it off. Cute but a little irritating when I’m trying to get chores done. I can’t believe how patient you’re being. I’d be doing jumping jacks trying to move her along (not that I’d be able to jump or anything). Can’t wait to see her! Wishing you good luck with baby and with Christmas! My firstwas born December 11; the second waited for midJanuary. I understand the “Christmas Lite” situation. Love that Dash is all about the vacuum! Merry Christmas and I hope that you are enjoying your little one soon!